Roughly an hour earlier Charlotte Chubb (not pictured) had won team advanced western horsemanship to put the University of Findlay ahead. Then it was Bryant Fox's turn to seal the deal. From Greenville, Ohio, Fox is seen here in the trophy room underneath the stands inside the Pennsylvania Farm Show Complex in Harrisburg, Pennsylvania on May 6th. The University of Findlay sophomore won the team intermediate western horsemanship division to raise the Oiler's team total from 18 to 25, clinching a National Championship with one team class still to go. Findlay won their sixth IHSA Nationals western team title and first in eight seasons. 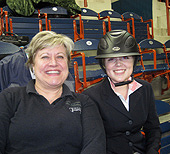 In 2018-19 Mary Pardee (on left) will become the Director of Riding for Lake Erie College. At IHSA Nationals Pardee was the Lake Erie Head Coach for one more event. The lone (undergraduate) member of the Storm to reach IHSA Nationals was Lissy Naber (on right). 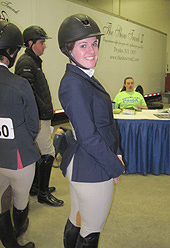 A junior from East Aurora, New York, Naber had won the individual intermediate on the flat at Zone 6 Zones in Westerville, Ohio on April 7th to advance to IHSA Nationals in Harrisburg, Pennsylvania. Naber finished fourth in the division at Nationals on May 3rd to close out a very exciting season. The Storm finished only four points behind Findlay in the hunter seat team standings (two shows which Findlay would have hosted February 17th and 18th were cancelled on short notice perhaps or perhaps not affecting the outcome). If you attended any of the Region 1 hunter seat IHSA shows in 2015-16 you would not have seen the University of Toledo. If you attended Zone 6 Zones hosted by Otterbein University of April 7th you would have seen a member of the two-year-old Toledo team place second in individual novice flat and advance to Nationals. That rider is Amelia Jacksy (on left), a sophomore from Maumee, Ohio who was a member of the first University of Toledo team one season earlier. 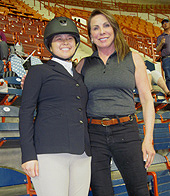 On May 3rd Jacksy (seen here with head coach Donna Rothman) become the first member of the Rockets' equestrian team in program history to compete at an IHSA National event. 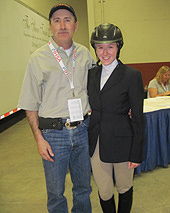 Jacksy placed seventh out of 16 entrees in the division in Harrisburg that day. 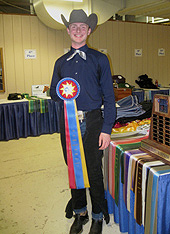 At 2017 IHSA Nationals Alan Durden of the University of Findlay finished seventh in team beginner western horsemanship. One year later Durden was entered at IHSA Nationals in the individual beginner western division and this time around the sophomore from Toledo, Ohio faired better. 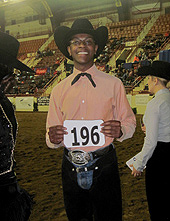 Riding with the number 196 Durden (pictured) was second in the individual beginner in Harrisburg on May 6th. Besides the Oilers winning the National Championship they had at least one rider in each of the six undergraduate Western classes and at least one rider placed fifth or higher in these individual divisions. 2016 Lake Erie College graduate Alexis Barter is seen here waiting for horse draw for the Alumni Flat at IHSA Nationals on May 5th. After having won the division at Zones Barter was sixth at Nationals in what has been the final hunter seat class of every IHSA season since 2009 (the remainder of the May 5th show schedule as well as all of May 6th was made up of western classes). He is both the Zone 6, Region 1 Region President and the head coach of Oberlin College. He is Ric Weitzel (on left) and he is posing here with Oberlin junior Lauren Fries. From New Hartford, New York Fries won individual walk-trot at Zone 6 Zones in Westerville, Ohio on April 7th to advance to Nationals and pose with Weitzel near the draw table on May 4th. 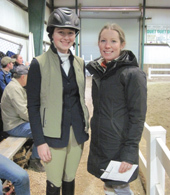 Seen here with University of Findlay hunter seat coach Alexandra Kemp - Thompson is freshman Meghan Moran (on left). From Bridgewater, Massachusetts, Moran is seen here at the January 20th Winter Tournament of Champions invitational in Coolville, Ohio where she won team intermediate flat to help the Oilers to 19 points for the day. Moran competed in team novice over fences at 2018 IHSA Nationals and put Findlay on the board with a fifth in the division. Schools competing in Zone 6, Region 1 during the 2018-2019 school year: Adrian College, Bowling Green State University, Case Western Reserve University, College of Wooster, Hillsdale College, Kent State University, Lake Erie College, Oberlin College, Thiel College, University of Akron, University of Findlay, University of Toledo and Walsh University.